Your garage floor is supposed to be dingy, dirty and stained, right? Wrong. You can give your garage floors a good workout and keep them looking gleaming and new. In fact, you can apply a coating to your floors that will withstand just about any form of abuse you can throw at it. How's that, you ask? An epoxy floor coating in your garage is the answer. Your garage floors will look great for years to come and you'll have an added layer of safety in your home. Epoxy is one of the most durable, versatile flooring products on the market today, and many homeowners have to come to rely on it to create a usable, attractive garage. So what is garage floor epoxy? Read on to learn more. Epoxy is a tough, long-lasting coating that is applied to your concrete garage floor. It won't absorb grease, oil and many other chemical substances that could ruin a paint job or stain concrete. Spills just wipe away from an epoxy coating, and you can customize the color to suit your personal tastes and preferences. When applied by a professional, epoxy floor coatings will make your garage floor look great for years to come. 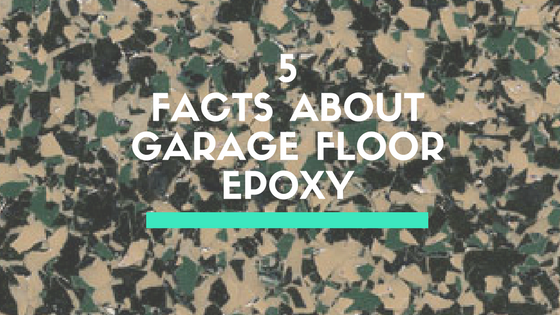 Learn more by reading these five facts about garage floor epoxy. Epoxy floor coating creates a highly durable surface for a floor. In fact, because of its durability, epoxy coatings are common in airplane hangers, heavy machine shops and warehouses where the floors really take a beating. If epoxy can hold up to a machine shop, it can certainly do the job in your garage. You can drop items and spill things and your floors will look no worse for wear. After the epoxy cures, you can drop just about anything without worrying about your floors. Epoxy is also resistant to chemicals, petroleum products and scratches. Feel free to drag a heavy item right across the floor. You won't find scratches or imperfections on the floor afterward. And since it's waterproof, you can pull your vehicle right into your garage when it's raining without worrying about how the water will affect your floor. Epoxy floor coatings are a great way to add an element of safety to your garage. After the epoxy cures, it will create a non-slip surface which will reduce the chances of an accident in your garage when the floors are wet from rain. It's also impact and heat resistant which will provide an extra layer of protection in your work area. Perhaps most notably, some epoxy coatings act as fire retardants. Some coatings include pigments that quickly expand when exposed to heat. The expansion creates a barrier of protection that lasts until a fire extinguishes itself or until a fire crew arrives to do it. It's no secret that epoxy garage coatings are nearly impenetrable, but why? What makes the coating so strong? In a word, the resins the epoxy is made from. The unique chemistry of the molecules in the epoxy resin makes them highly resistant to chemicals, air and water as well as corrosive materials, heat and petroleum products. Chemistry is also responsible for epoxy's adhesive capabilities. Epoxy has 1.5 thousand pounds of adhesive power for every square inch of flooring. That means the epoxy will adhere to the floor for a long period of time, even after being exposed to heavy loads and abuse. What's more, epoxy is one of the few flooring systems that can be installed over existing concrete floors. Epoxy is a very practical option for your garage floor, but it can also be attractive as well. Dozens of different color options are available with epoxy floor coatings. 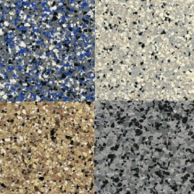 In fact, you can customize your garage floor with more than one color. Want to deck out your garage with your favorite sports teams' colors? We can accommodate that. Want to make the space a true showpiece? With the ability to custom blend epoxy floor coatings, we can exceed your expectations. Colors are available in a variety of solid colors like beige, tan, grey, black, white, blue, green, red and yellow. Or opt for a decorative chip floor coating. These coatings look similar to granite with blends of gray, black, brown, white, silver and blue. Use one of our stock chip designs or let us customize one for your garage. Whatever color you chose, you'll be left with a durable, impact-resistant floor that looks like new for years to come. You won't see chips, fading or other imperfections at all! You'll use less water to clean since epoxy flooring does not trap dirt and grime. The flooring is seamless so there are no cracks and crevices where insects can hide. A seamless floor also makes cleaning easier and more thorough so any insects that are present require fewer pesticides to control. That lowers your overall operations cost. Epoxy is the smart choice for garage floors and commercial floors since it looks great, withstands even the heaviest usage, is easy to clean and is affordable. Contact us today to learn more about adding epoxy floors to your garage or business today!